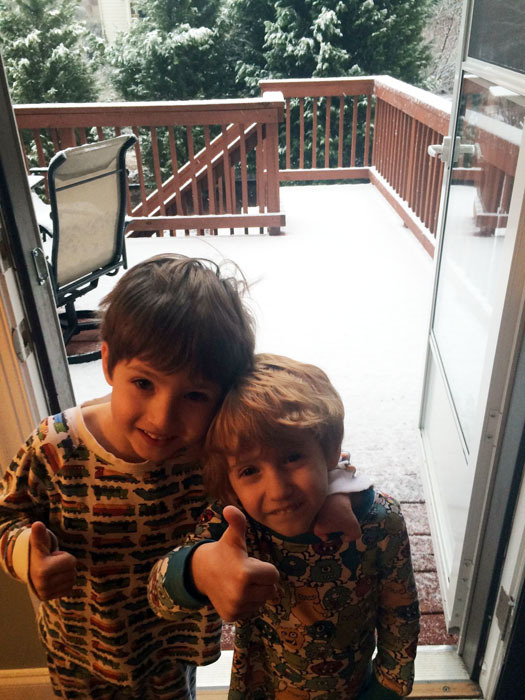 My grandsons are enjoying their first winter in northern Georgia and it is a bit different than northern Illinois. When Jake heard there was snow in Illinois he got really sad. He loves snow! He always has. 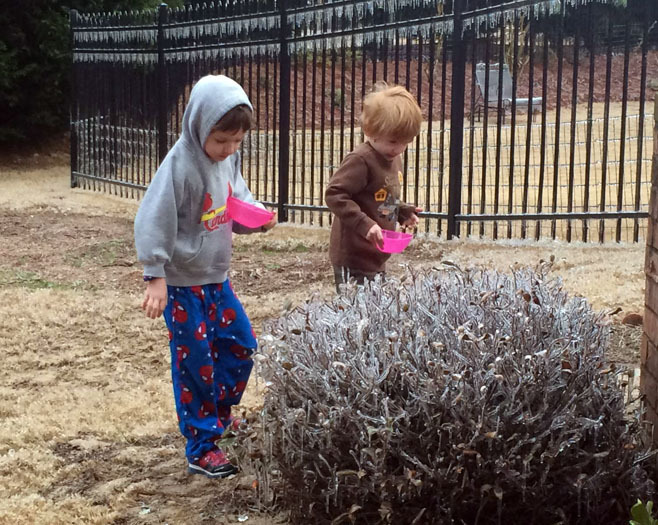 I’m not sure my grandsons ever thought that way about snow. 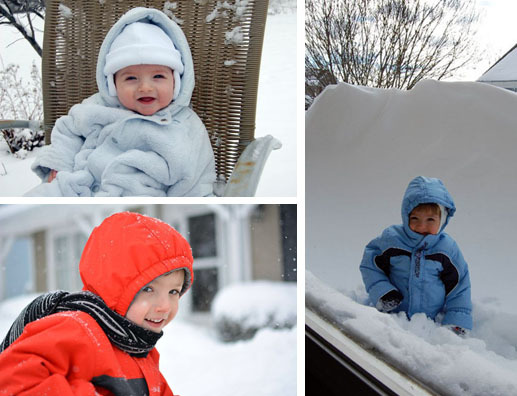 I can’t imagine them saying, “If I had deep snow, I’d start playing.” They play every day! 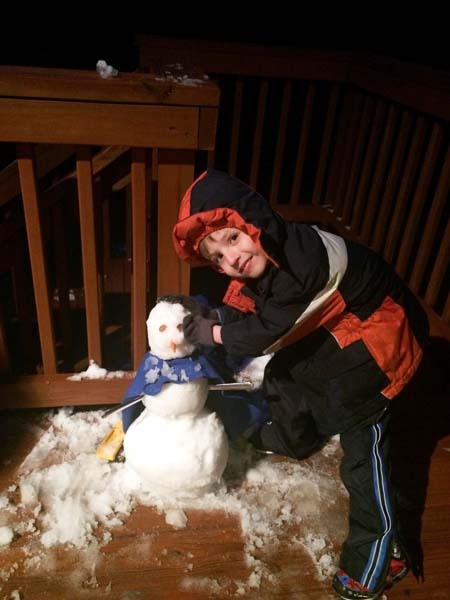 Not having snow doesn’t prevent them from playing – they have other things to play with. Not having the gift or ministry that we think we deserve, or that we think we’d be good at, or that we covet shouldn’t keep us from serving either. We have other things we can use. Every Christian has a gift of some kind – God doesn’t hold back! You have a gift. You probably know what it is. Where are you using it? Are you praying for a different gift? What if God gives you something other than what you are asking, hoping, or waiting for? Will you use that gift? One day last week, it did snow! Not a lot, but enough for two thumbs up! …but he got a little. Then, he had to make a choice: sit inside hoping for more snow, or use what he received. 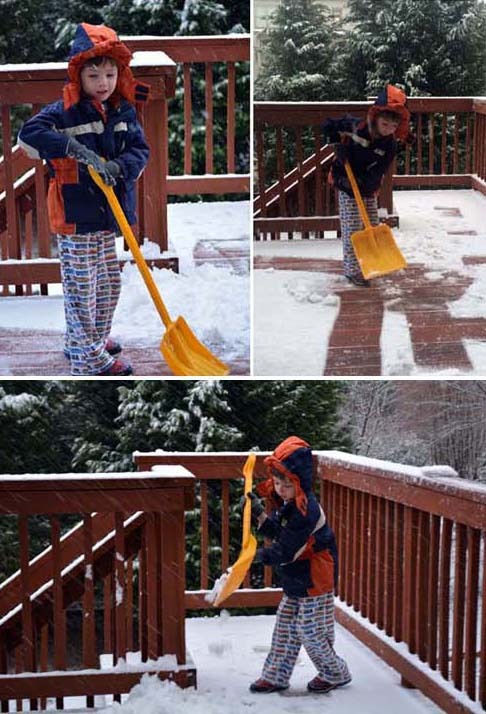 Since everyone knows you have to shovel snow while you can, Jake decided to get to work (even before he got out of his pajamas)! 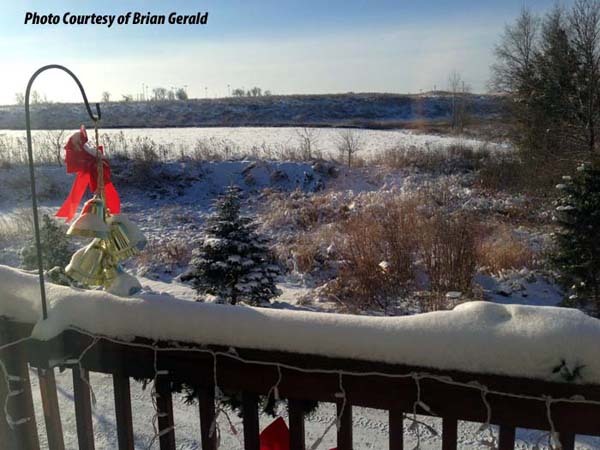 It’s a good thing he took his snow shovel with him when he moved – someone has to clear the deck! Jake chose to use the tools he had to make the most he could out of his little dusting of snow. He grabbed a few diggers and dumpers and soon he had enough snow together to build a snowman! When we focus on what we don’t have, it’s easy to overlook the gifts and resources that we do have. God has given us the gifts and resources that he expects us to use. It may not be what we want – or in the abundance that we think we want, but it is exactly what God wants us to have. If we neglect to use it while we have it, will it melt away? Will you put to use the gift God has given you, serving wholeheartedly where you are with the resources you have? You might be surprised at what you can accomplish. As I was reading Marcia’s blog this morning, I kept thinking of you. I am so excited to see all the wonderful things God has in store for your future. He is using you now and preparing you for how he is going to use the different gifts he has given you for such a time as this. I’m walking with you on your journey and I anticipate and look forward to the good things God has in store. There are so many things to be thankful for and I thank him for you and the gifts he has given you. I thank God for working in Al’s heart and growing him. I look forward to all God is going to do in Al and how he is going to change him from the inside out. May you trust in God’s goodness and know he holds you and your future in the palm of His wonderful hand. I love you! enjoy reading the blog and shine! We are blessed.The gifts we have are the promise Jesus left us. Whoever believes in me I will walk beside you to the end of your life. Marcia, thank you for your blogs. I comment so often to Monnie how each one is just what I needed to hear and at times very convicting. I have journaled on so many of them and this one will be no different! !